Performance: Mayo Miwa is a Japanese actress of the classical mask theatre called “Noh”. Noh is a theatrical art form from the 14th century that has been handed down for 650 years and one of the oldest performing arts in Japan. Mayo Miwa majored in Noh theatre at Tokyo University of the Arts, trained at Kanze School and performed as a member of the Kanze theatre troop in Japan. Since moving to New York she has been collaborating with artists from different media, such as contemporary composers, jazz musicians, and video artists, to develop the art of Noh in contemporary forms. 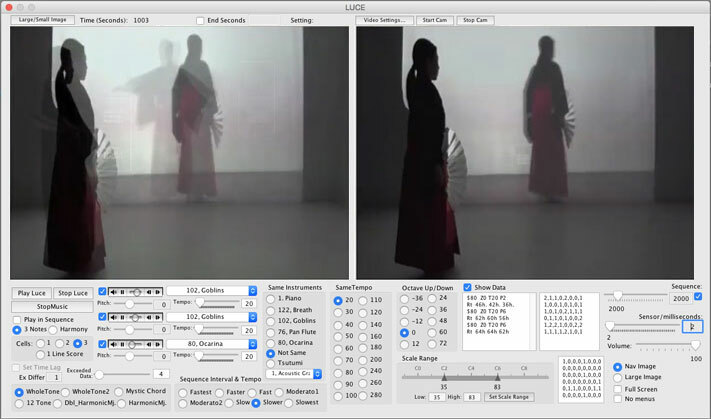 Related project by Kenji Kojima: Luce "Webcam as an instrument"